A number of species in the Brachychiton genus are widely used in landscaping, most are well known by their common name. Brachychiton rupestris is the ‘Queensland Bottle Tree’ and Brachychiton acerfolius is the ‘Illawarra Flame Tree’ and are the best known species. B. rupestris with its bottle shaped trunk is easily identified. Brachychiton acerifolius or ‘Illawarra Flame Tree’ is a slow growing drought tolerant tree with masses of pink to red flowers in Spring/Summer. 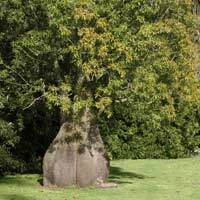 B. rupestris or “Qld Bottle Tree” and B. populneus both make a great feature trees in any garden or park and are popular landscaping feature and are readily available form sale online. Large specimen trees are available from specialist growers and these include some magnificent feature trees used in large landscaping projects. Some suppliers are such as China Trading Co, are specialists in sourcing transporting and transplanting large specimens trees for commercial projects. B. discolor or ‘Lacebark’ or Scrub bottle tree.